Yesterday I treated myself to an immersion experience of Sock Knitting. I so love workshops, and just being in the presence of the amazing sock knitting expert, Sue Grandfield (Riotous Assembly on Ravelry), made my heart glad. Check out her amazing wall of glorious socks she brought along for show and tell (all knit by Sue!)!! Yum! Love that garter stitch heel and toe! check out the Tolkeinish word HOBBIT at the top!!!! 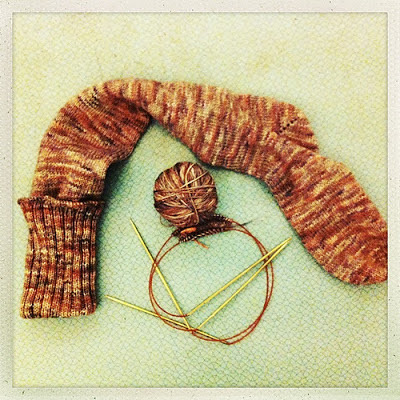 And learnt the most stretchy fabulous cast off, Jeny's Surprisingly Stretchy Bind Off. Thank You Sue for a day of inspiration!! I then went into the city to Morris and Sons and took a few snaps of their lovely yarn bike! Sue Grandfield will be teaching a colourwork workshop there next weekend!! Mother of all Mud Caps! Hitch by Brooklyn Tweed in Rowan Felted tweed DK (clay), a gorgeous Dolmen sleeve jumper (pullover/sweater) with a panel of cables and lace up the front. Camilla Kid by Madder in Quince and Co Osprey in Bird's Egg Blue. I am in love with the Osprey yarn, super squooshy and airy!! It's going to be so comfy and warm. wow jo! those socks! i would have loved to take that workshop with you! and all your knits, LOVE hitch and camilla. i made anabel in osprey, it is SO lovely. Wish you had been able to come to the workshop too!! In an ideal world I'd have been there too. However I shall live a while, vicariously through your woolly adventures Obi.....looking forward to our sangin' in the mornin' sugar!